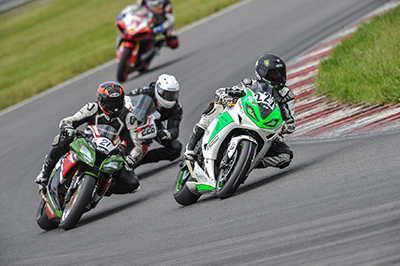 The DMV Circuit Championship (DRC) is the National German Motorcycle Championship and is considered as a substructure of the IDM (International German Motorcycle Championship). It acts as a career jumping board and a cost-effective broad sports base. The DRC is subject to the regulations of the German Motor Sports Federation (DMSB) and the German Motor Sports Association (DMV). Valuation points that have been entered with a B license in the DRC are the prerequisite for applying an A / I license! The training days can be booked individually. 2-day registrations are prioritized. The Moto1 and the STK1000 will be grouped together in the course of the event to the Moto1000, trainings and races together, but will be evaluated separately (see evaluation). The Moto2 and the STK600 will be combined in the course of the event to the Moto600, trainings and races together, but will be evaluated separately (see evaluation). The Moto Lightweight open and the Moto Lightweight STK will be combined in the course of the event to the Moto Lightweight, trainings and races together, but will be evaluated separately (see evaluation). The Moto600 and Moto1000 time window: minimum 2 qualification turns, 1 warm up and 2 races (one race over 15 minutes + 1 lap, 1 race over 20 minutes + 1 laps) are usually riding. In events with a total of 30 participants in classes SBS Moto1, Pirelli Superstock 1000, Motul Moto2 and Pirelli Superstock 600, these classes run in a time window, are evaluated separately and started with wave start. All race participants with an A/I or B-license get points if they are inscripted in the series. The inscription of holders of an A / I license can be refused without specification of reasons. The enrollment remains as a kind of club membership and contains a multitude of financial advantages. The C- or V- license remains to the right to participate, no points for holders of an C-license. The classes Moto 1 and Superstock (STK) 1000 respectively Moto2 and Superstock (STK) 600 drive the races together in the racing windows Moto1000 and Moto600, but are evaluated separately. All starters (Moto1 and STK1000) will now be evaluated together in the Moto1 class in the Moto1 race and only the riders of the Superstock 1000 will receive a special rating. This is analogous to the Moto600. This regulation gives STK drivers the opportunity to use a great performance in the overall classification in the form of points and recognition. In addition, the results of the Moto1 and Moto2 offer a much more realistic impression of racing. Pirelli and Bike Promotion agree to introduce a tire monobrand control for the Superstock classes. One of the most significant changes for the DRC season 2016 is the tire regulation. Starting from 2016, the Pirelli Superstock series will be started in the DRC, that is, the 600 and 1000 DRC classes will only be applied to Pirelli tires. This monobrand agreement, as commonly known from the Superbike World Championship, is intended to achieve five goals: to ensure high-quality racing tires at very attractive prices; Sporting equality of opportunity, broaden the marketing base, ensure a consistently high standard of service and logistics, and also make a fantastic award for riders who are not constantly on the podium. For the Superstock classes, an upper limit is set for the number of tires to be used per event. This is intended to cover the costs and exacerbate the demarcation from the open classes. The DRC classes STK1000 and STK600 are marketed as monobrand classes on the tire brand Pirelli. The training and races of these classes may only be completed on Pirelli tires (with tire stickers of the series). There is a permanent check on the use of the tires. The dimensions and compounds/mixtures which can be used are shown in the following list. Pirelli supports the drivers with a significantly reduced price per tire and free assembly of the new tires compared to the price list. - Pirelli patch / branding on the leather comb in the chest area (at least 7 cm wide) and above the buttocks (at least 28 cm wide). Stickers and patches can be ordered from Bike Promotion. Reference: The tires are always purchased from the Bike Promotion tire service. All registered participants of an event are allowed to purchase the released tires at a special price. The special price list is sent by mail or on the spot. For registered drivers with a contract, the tires will be sent to the special conditions on request in advance (against the additional shipping costs). All tires are fitted with tire stickers by the Bike Promotion tire service. Riding the track with other brands or without stickers on tires can be denied in the training and races of the respective class. Controls take place in all trainings and races. The use of non-approved tires leads to the exclusion of the value. In free trainings, which can be booked separately (training days before the event, free bookable turns within the DRC event) there is no obligation to use the DRC tires. For the first time in many years there will also be a prize money in the DRC for the Pirelli Superstock 600 and Pirelli Superstock 1000 respectively. A point bonus of EUR 3 per point is planned. In addition, the winners of the Pirelli Superstock 600 and Pirelli Superstock 1000 will be given free of charge at the IDM final in Hockenheim. The maximum tires that can be used there are provided free of charge and the nominal fee for the event is taken over by Pirelli. In communication, Pirelli and Bike Promotion will accompany the series in a concerted manner. All available communication channels will be used by both parties to disseminate information and results widely. Among other things, it is also planned to organize a video production at least 3 events, to act as a visitor and to use stretching speakers.